Good outline of the steps to start a new business. Start a Successful Business was written by the reporters of Inc. magazine and published by the American Management Association. It clearly states the steps needed to start a new business. Beginning with the big idea moving through business strategy and structure, the book’s instructions are clear and concise. It gives options for funding sources, customer acquisition, marketing, management, and growth strategies. 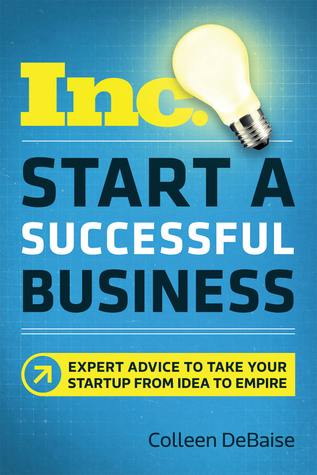 Start a Successful Business includes research studies and interviews with Inc. magazine’s top entrepreneurs. It is filled with real life examples of how successful entrepreneurs solved their initial problems. Start a Successful Business will motivate and educate people unfamiliar with how new businesses are started and made successful. For those with a class or two in business, this may be too simple an overview. Later sections on marketing and customer acquisition only skim the surface of each topic. However, the book does include good references to books or websites for more in depth study. Overall, I was expecting more, and probably too much, from the authors of Inc. magazine. It is strictly for people who want to start a new business but have no idea how to do it. For those readers, it is highly recommended. For all others, it seems like a pass. Averaging out to 3 stars. Thanks to the publisher, AMACOM Books, and NetGalley for an advanced copy.